Plan, plan and plan some more to keep yourself organised. So now you know what paperwork is necessary in smoothly running a business (If not visit our previous post) do you know how to plan it all in to your time? Finding the time to squeeze in extra work when you are so focused on the actual income generating aspect of your business can be difficult especially if you aim to do it yourself. The easiest way to do things is use what you already have. Set up your business pages and email on your smart phone, then you can nosey and post where ever you are when you have 5 minutes break between jobs. However set up your notifications so that you are only bothered by them between your working hours, giving you time off on an evening and weekend to chill without the ‘chirp’ of your work disrupting. Plan, plan and plan some more, the more work you have the more likely you are something will fall through the cracks. If you do not work on Sundays then take an hour or two to sit and type up some blog posts or social media posts, sign up to HootSuite or a similar software so that you can then schedule them to post across all your social media platforms ahead of time. As emails come in during the day highlight ones that will need responding and act on the urgent important one, then dedicate on hour on an evening where you go through the non-important emails you marked earlier. Choose a reasonable time so that your customers are seeing your emails as they come in. For example emailing out at 11pm at night means for some of your customers that email will be at the bottom of the pile when they check in the morning. 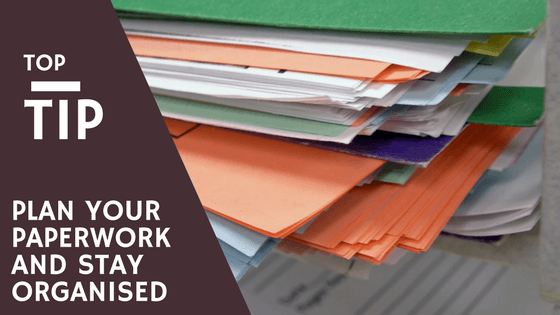 Once a week or fortnight set aside a few hours to go through your paperwork that has piled up – your invoices, new client information in hard copy, receipts etc. This way you can get it all tidied up efficiently and without the piles getting too big, if you have payment terms of 28 days then you can also chase up invoices during this time that have not been paid and you can easily work out the time frame without counting days. If remember all these set aside times and what to do when gets confusing then use a simple planner. Highlight what is done on each day and if it is the same every week have weekly reminders set up. We use Wunderlist for everything, setting up weekly alarms for regular tasks and even alarms for the certain twitter hashtag hours we participate in so we do not have to remember them all. Do you prefer paper planners? Then set up a simple week page that can list all the tasks required on each day, and if there is a deadlines looking highlight them with bright colours so they catch your eye and you are constantly aware of them. If all of this is still too time consuming and you would much rather leave it to someone else then consider hiring a virtual assistant who can take all this on for you and free up more of your time to relax with family and friends. Call today for more information about Virtual Assistant services.